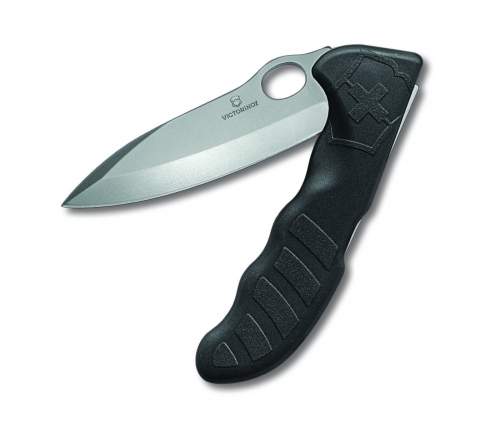 The Hunter's Knife from Victorinox was developed from scratch as a special knife for hunters in the United States. Hunters in some countries require a tailored hunting knife that does not require any additional tools. The Hunter Pro is the result of this particular challenge. It comes with a large one-handed blade which locks. The ergonomic shape lends the hunting knife an extremely stable grip. The knife comes supplied with a green case which has a belt loop and velcro flap closure and is gift boxed. Victorinox guarantees all knives and tools to be of first class stainless steel and also guarantees a life time against any defects in material and workmanship. It is illegal to supply a knife to anyone under the age of 18 years. Woodland Ways actively checks the details of all orders for knives, and other edged items. Should we be unable to confirm your eligibility, you will be asked to provide proof of age in the form of a photocopy of your drivers licence or passport.